The title as quoted above is Debussy’s own wording – and rather misleading, since he wrote no other string quartet, and gave no other piece an opus number. The quartet was written for a Paris music society which admired the classical Germanic tradition of Haydn, Mozart and Beethoven, in preference to the more frivolous path which most French music (opera comique etc) had taken since the 1860s. The piece is classically structured – four conventional movements derived from the opening motif. But within this structure, Debussy weaves his own densely detailed magic, using modal along with tonal harmonies. Sadly, neither the society’s members nor Debussy’s supporters were impressed. The kindest comment being that it was ‘bewilderingly full of originality and charm, but diabolically difficult’. Subsequent audiences have thought differently. Debussy admired Cesar Franck’s use of ‘cyclical form’, where material reappears in later movements – as also in Haydn quartets. Thus the quartet’s opening reappears in the viola’s opening theme in the second, Assez vif, movement. And cyclic form appears also in the final movement, which gave Debussy problems (‘I think I can finally show you the final movement of the quartet which has made me really miserable.’) After about 100 bars, the work’s opening theme reappears at half speed, and a third lower. It then grows to dominate the movement’s native material before the triumphant close. 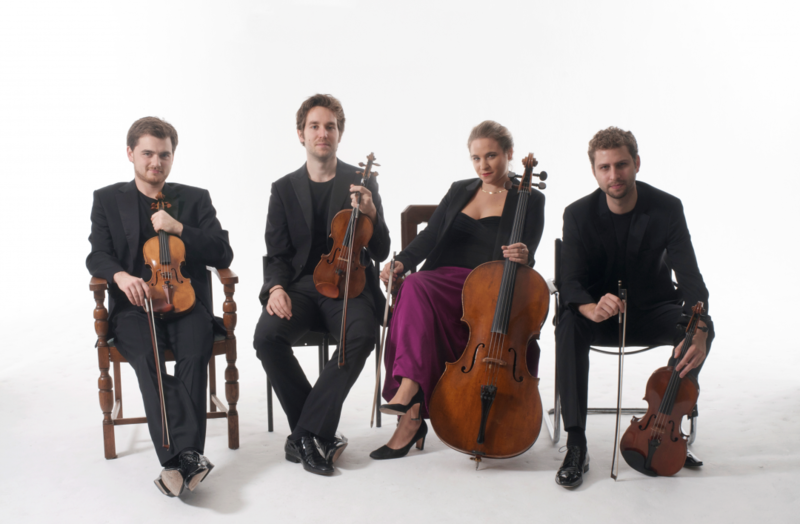 The Three Divertimenti are a set of individual character pieces meant as a ‘pleasing entertainment’ without necessarily any serious import or the larger formal considerations implied by a multi-movement string quartet. The bristling rhythms, glissandi and colourful harmonics of the first piece ‘March’ immediately place the music in the 20th century in terms of style, but – as with most of Britten’s compositions – the music is tonal, accessible and immediately appealing. Nonetheless, there are also suggestions of Stravinsky, Bartok and Britten’s teacher Frank Bridge. The second movement ‘Waltz’ is technically more tame, with compelling textures and traditional chamber music dialogue, and something of an English pastoral character. The last piece titled ‘Burlesque’ reprises the unmistakable vibrancy of 20th century rhythms, techniques and sonorities, in a mini-masterwork of colour and dynamic contrast. This is the last major piece written by Beethoven, and in its original form with the Grosse Fuge – as played this evening – his longest quartet – just over 50 minutes. The audience at the first performance (which Beethoven chose not to attend, instead sitting in a nearby tavern) demanded encores of the second and fourth movements, but were silent on the fugue. Beethoven called the audience ‘cattle and asses’ . The musical press also castigated it – ‘as incomprehensible as Chinese’. And his friends persuaded him that the fugue was almost unplayable for them too. Beethoven gave in, providing a shorter, lighter and easier finale. But at the same time, both Beethoven and Schuppanzigh, who gave the quartet’s first performance, never had any doubt that the Grosse Fuge would reclaim its rightful place once future generations had learned to appreciate it – which indeed happened. Creating, in Stravinsky’s words, ‘This absolutely contemporary piece of music, which will be forever contemporary’. The first movement is a beautiful improvisatory adagio and allegro, followed by a very fast and short scherzo in the tonic minor. The third movement, ambling gently and delicately, with many original quartet textures, is in the related key of D flat. Then come the simple Alla Danza tedesca (a German dance). But suddenly, in the strange key of G major, as far as possible from D flat, there is a switch to the other side of the harmonic universe. This violent dissociation, expressed in the simplest language, is the secret heart of the work, psychologically connected with the first movement, and with the Grosse Fuge to come. From G major it is an easy step to the E flat of the Cavatina – (a simple, melodious air). Karl Holz, second violin in the Schuppenzigh Quartet, said that it ‘cost the composer tears in the writing and brought the confession that nothing he had written had so moved him’. The note G at the top of its last chord begins both the Grosse Fuge and the second finale. Listen out for the crying figure in the first violin with the other instruments pulsating underneath. The Fuge is a mighty struggle stretching the mind and sinews to the limit – one of the great artistic testaments to the capacity for the human spirit to find meaning amidst threat of chaos. The writing is jagged and austere. Following the overtura, there is an evocation of the preceding Cavatina, with eerie double notes for the first violin only. The fugue proper then defiantly announces itself with disjunct, painful and unvocal leaps. It is worked out at ferocious length in music of immense complexity and technical difficulty. But whilst shouting and on the brink of whirling into chaos, the argument of the fugue is actually tightly ordered. Essentially, the task of the Grosse Fuge is to make sense of the ever-present possibility of complete collapse: to bring resolve and purpose to the human condition in the midst of uncertainty – one of the composer’s most inspiring achievements. The turn to clarity and quiet optimism happens late in the movement, and quickly -but unmistakable and moving beyond words.